While landing on a wet section of the runway, however, the nosewheel of the GB-6 dug in and it flipped over violently. The pilot was only slightly injured. Only the wing was salvageable. Georges Briffaud considered re-using it by enlarging it for use in a motorglider project, the GB-80. This was a midwing single-seater whose engine, placed near the center of gravity, was to drive via a short driveshaft a two-bladed propeller located between the fixed vertical fin and the rudder. This solution had the advantage of fairing in the propeller during soaring flight without requiring feathering or the retraction of the engine-propeller assembly. The airframe was of fabric-covered wood; the cockpit was equipped with a molded canopy. The GB-80 made its first flight as a glider on 21 September 1960 at Beynes with pilot Jacques Gomy at the controls, pulled by the club towplane. During succeeding flights, several modifications proved necessary, notably an increase in rudder area. 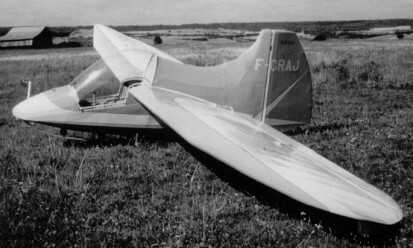 Handling of the GB-80 was similar to that of other gliders of the same generation, and the machine's wing performance was close to that of the Nord 2000 (French version of the German "Meise"), despite a low aspect ratio of only 7.6. It received its certificate of airworthiness (CNRP) on 4 July 1961. On one flight, it was double-towed with another flying wing, the AV-36 flown by Eric Nessler. The motor originally intended for it, a 2-stroke, 18 hp Kroeber, was never installed, being replaced by an equivalent weight of ballast. The engine had no starter, and the development of that accessory was never completed (Charles Fauvel faced similar problems with the AV-45). Georges Briffaud designed a version designated GB-81, with a new, easier to build fuselage, but that project was never realized. Disappointed, Georges Briffaud decided in 1963 to dismantle the GB-80.